Like in many other Soth East Asian countries the people in Indonesia love to eat currys. This typical Indonesian paste is strongly influenced by the Indian cuisine. The currypaste contains many fresh and spicy ingredients. The paste is also very smooth and creamy because of the cashew nuts. You should know that there is always a little more effort when you make your own currypaste. But we are pretty sure that you can taste the difference in the end. 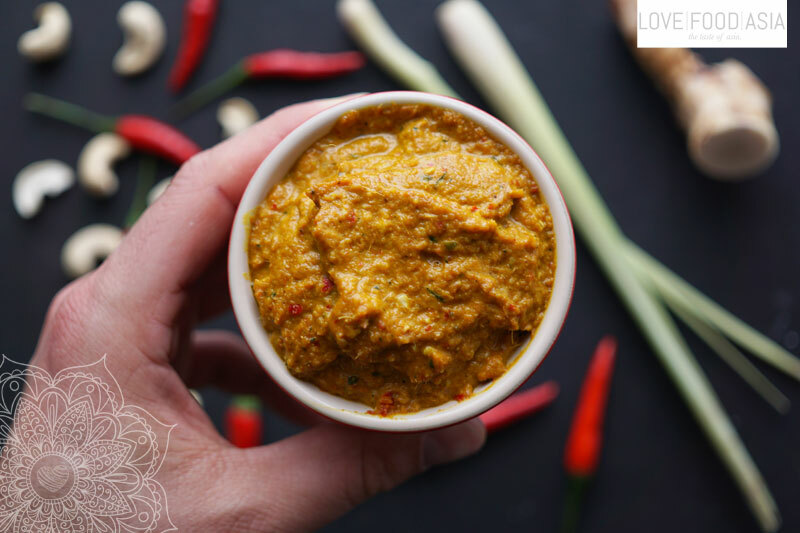 This simple Indonesian currypaste can be used for many Indonesian dishes like Beef Rendang or Indonesian Chicken Curry and can be stored in the fridge for weeks. Mix onion in a food processor until it is finely chopped. Prestle chilis, peppercorns, lemongrass (the white part), galangal, garlic and kaffir lime leaves in a mortar to release the flavours. Transfer to food processor and mix until you have a smooth paste. Roast coriander, turmeric, cumin and cashews in a frying pan on low heat for 1-2 minutes. Transfer roasted herbs, shrimp paste and salt to the food processor and continue mixing until you have a fine and smooth paste. Heat oil in a frying pan. Pour paste into the pan and stir occasionally. Simmer on low heat for 10 minutes. Transfer to a storing jar when the paste has cooled down. The paste keeps fresh for at least 4 weeks in the fridge.